The 100 lbs of live rock has been curing since friday night. Day 1: Got rock and rinsed it in a bucket of salt water to knock off loose debris and pull off large dead stuff. I then put it in the can in which the skimmer, 4 powerheads and a heater were working. I tried to stack the rock as loose as possible to avoid dead water movement spots. I purchased to 1 gallon paint strainer bags (the fine mesh ones) to put all the sand and small pieces of rock and debris in to seed the sand bed with. This worked out really well. Those things can hold a lot of very fine material and they are affordable at about a $1 each. Day 2: Cleaned the skimmer cup about 4 times. Also made sure all powerheads were functioning. Day 3: Skimmer cup. Tested ammonia. Found ammonia. Started preparing a 100% water change in can 2. Day 4: Did 100% water change. Rinsed rock pieces again, inspected them for any large dead debris. Rinsed debris/sand bags. Day 5: Skimmer cup. Top off water added. Day 6: (Today 11/23/06) Skimmer cup. Top off. Test for ammonia and nitrite. Low levels of each showed up. So when do I do another water change? 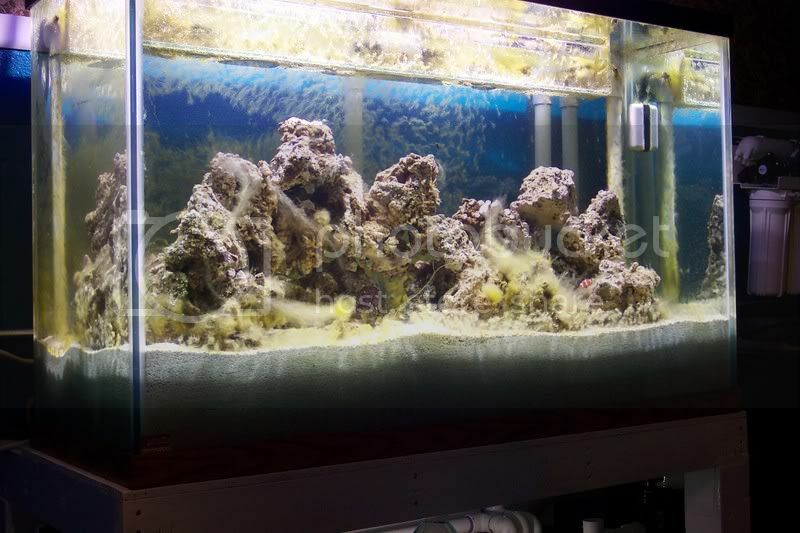 Should I let the nitrite and ammonia levels rise a bit or do I need to change the water asap? There are so many schools of thought on how this process should be handled. I would love a little input. I would just let it run unless the levels decide to spike. THe whole process is about letting the different biological entities that died in shipping run their natural cycle of decay and the eventual release of their biomass into the water. High levels don't hurt anything as long as there is no livestock in the system. I sounds like you have already have a better setup than most people use to cure liverock. As long as the measured levels are on the decline then I think you are doing great. My major concern would be the Ammonia spike followed by the nitrate and nitrite spikes that naturally occour don't happen in your show tank. Thanks for the reply Todd. Everything seemed to be looking on the up and up! I wouldnt sweat it. The vast majority of my LR that I have came mail order, and shipped in NO water. I was kinda peeved at first, but there was a lot of life that sprouted up off those rocks in the weeks to come. Im guessing that most of whats able to, goes and hides in the center of the rocks. I wouldnt be to upset about your liverock Oceanic. All LR is shipped dry. The costs of shipping it in water would be far to great. Aquatic_Matt wrote: I wouldnt be to upset about your liverock Oceanic. All LR is shipped dry. The costs of shipping it in water would be far to great. Close inspection of the rock led me to believe it was ready for the tank. The skimmer was not pulling out nearly as much nastiness, the foul smell was gone, all in all it seemed healthy. Level of nitrite was declining. I gave the stuff one more rinse and in the tank it went! The sand bend ended up being about 7 inches deep. I seeded the southdown in the fuge with the slurry I had saved from the bottom of the liverock boxes. Now the big wait. I plan on letting the tank sit for months before adding any livestock. I want the sandbed and liverock to bloom with life. In the meantime if anyone would ever like to peek at any of the work that has been done on this project just shoot me a pm. That is one great looking setup. I could spend hours looking at that tank! Rock looks great, keep up the good work !!! I was showing your progress from a dungeon to- voila!!! to my wife and her jaw dropped!! haha good work man! I wish I have a spare room like yours where I can put my "fish toys" as my wife calls it in. Thank you for the kind feedback all! Its been about a month since the last update. I have been swamped at work with end of the year stuff so tank time has been a bit limited. 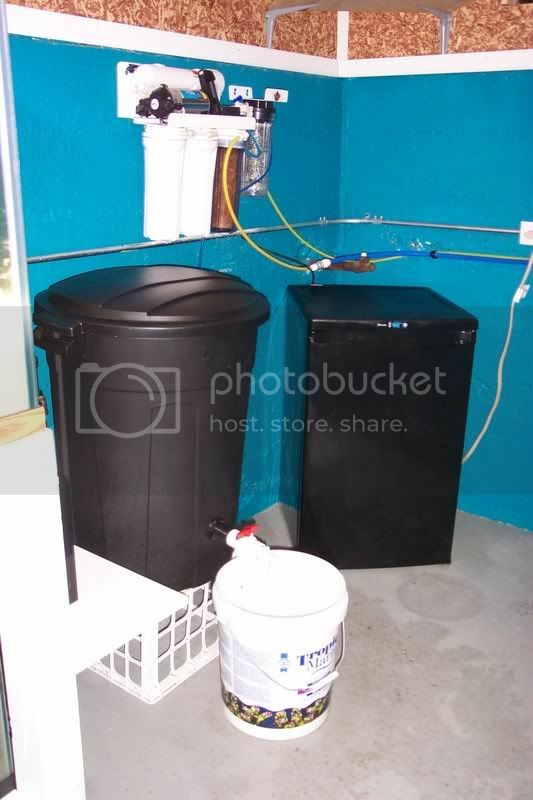 I was able to run a water line into the room and set up my RO/DI and topoff. I will be getting the switches for the sump this week. Things are pretty green in the display tank at the moment. I added snails and crabs about two weeks ago and the algae is disappearing. 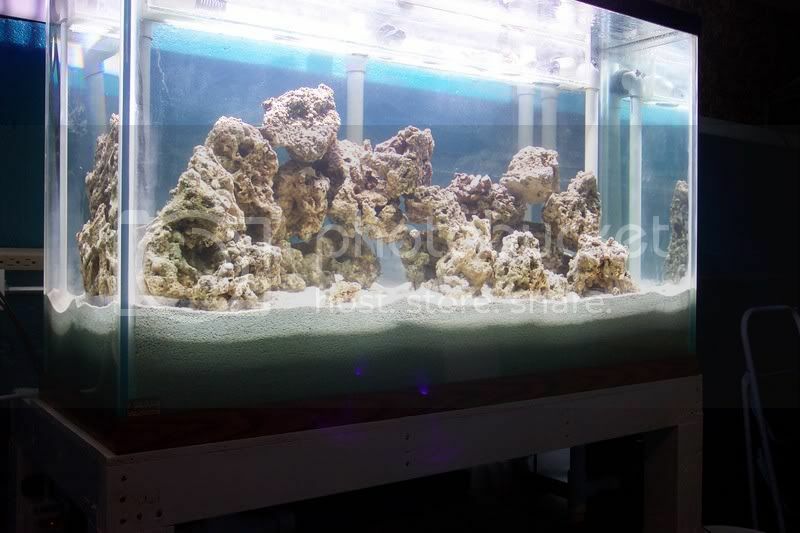 I need to do a nice water change and scrape off all the yuck and things should be much better. I got my fuge light and some macro in there today. Im just gonna shut it all down and do a thorough clean up. The algae bloom in the 18 gallon is slowly clearing up as well. I'm having a lot of fun with the 10 gallon. I've thrown a few frags in there and they have all attached and are doing well. The Macro really intrigues me. I hope to get a few different varieties yet. 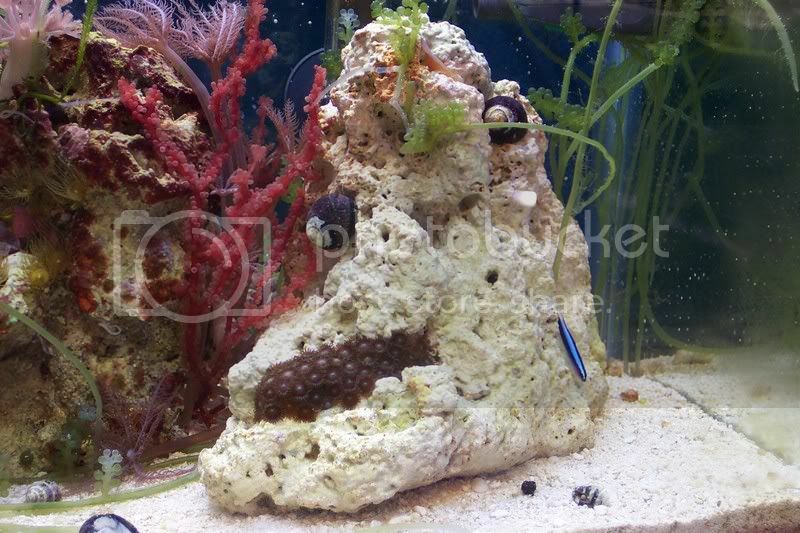 I added a little neon goby and a few snails and crabs to the tank. Thanks for looking all... Have a wonderful holiday season! 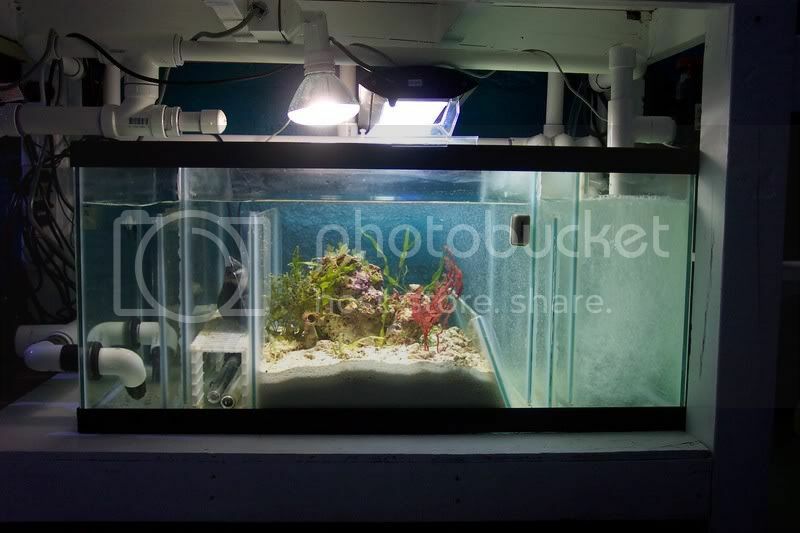 Geez, your big tank is really looking nice! I wish my display was as nice as your small tank. Thank you as always for the pleasant comments. It is very appreciated. I hope the new year is treating you all well. Its been about six months since I started work on my little project, so I thought it would be a nice time to share a few things with all of your brilliant minds. Things have moved forward pretty smoothly. Other than a little mishap with some water on the floor from messing up the installation of an auto top-off. 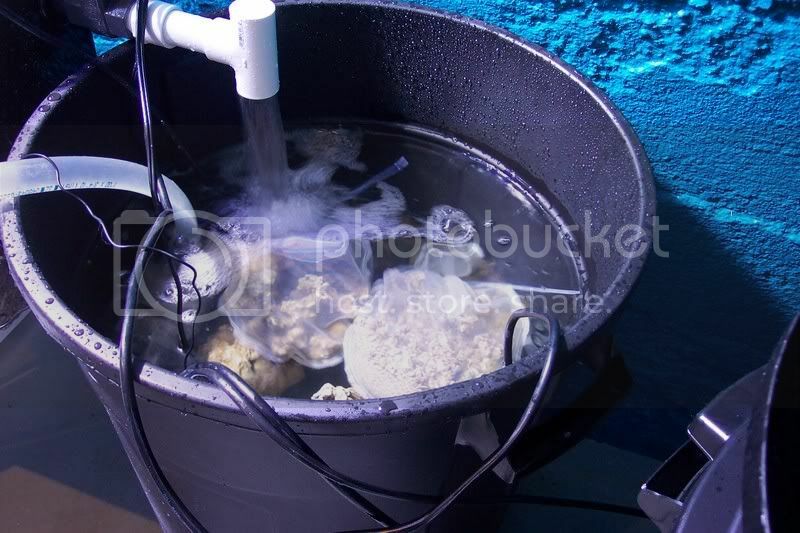 I forgot to turn off my RO/DI and had quite a few gallons of freshwater flow into the sump. Whoops! I have taken steps to keep this from happening again. I added more snails and crabs. Also a large brittle star, a yellow tang, a purple basslet and a porcelain crab. I am awaiting a pair of pygmy angels from Meisen. Once they go in I will not be adding any additional fish for a few months. 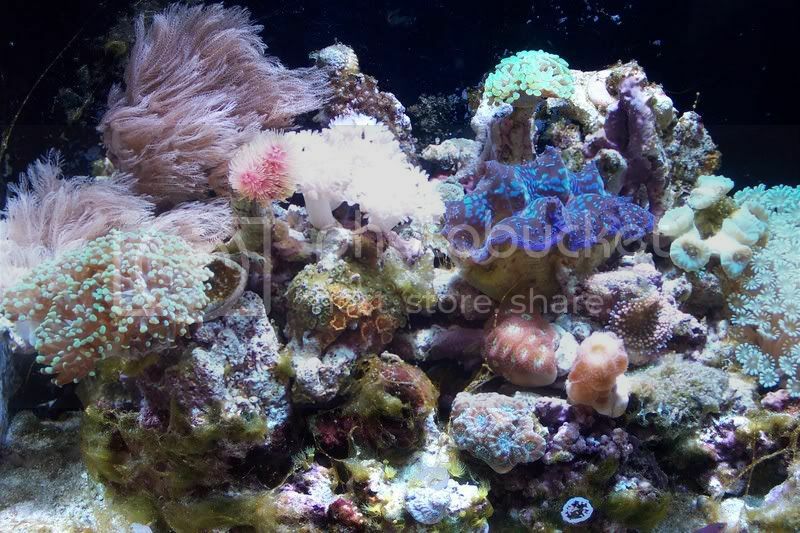 I am going to work on getting my water as stable as possible in preparation for corals. 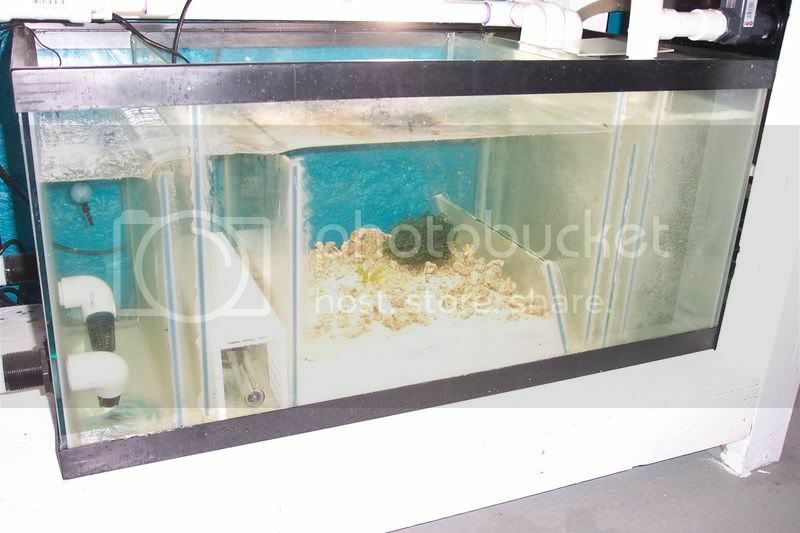 I decided to tear down the 10G I had set up as an observation tank and move the majority of its contents to the main tanks refugium. Should be a nice addition. The rock was crawling in Stomatellas, pods and worms. 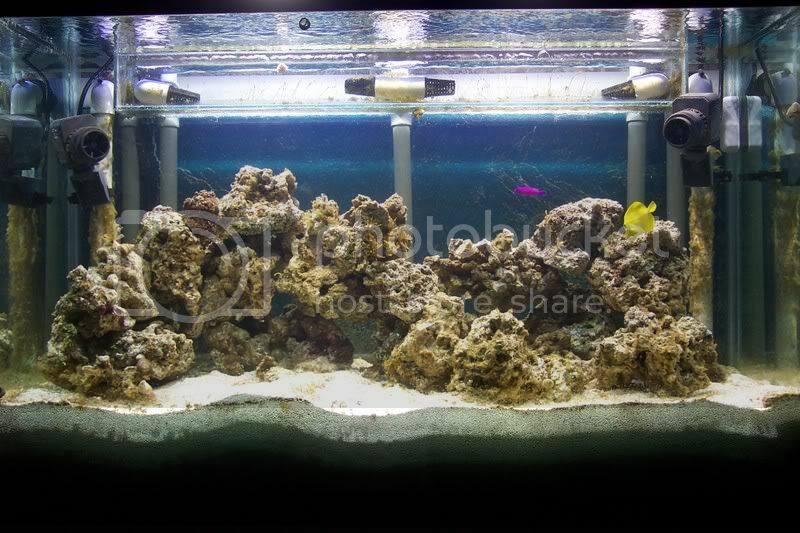 Sump with new Macro and Rock from observation tank. This sump design has been a joy. Thank you Toddah! Zero microbubbles returned to display. Things looking a little less green. 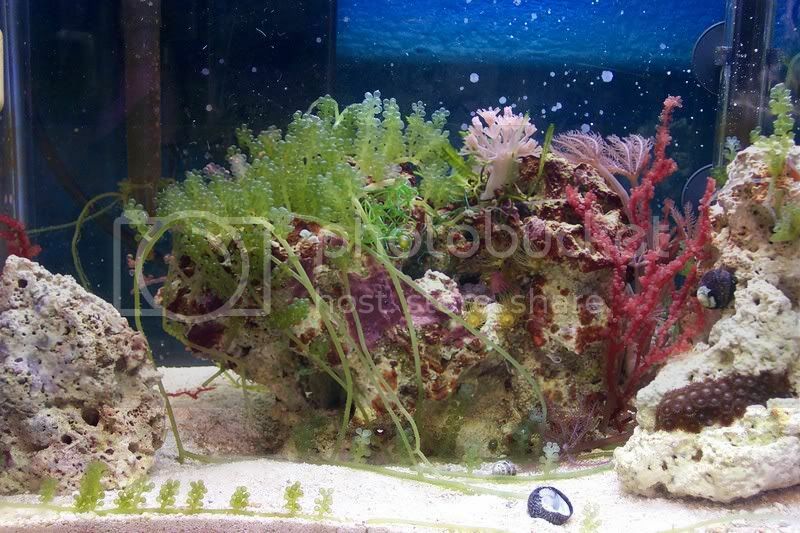 Need a couple of those Algae Free magnet holders for the Seio's. Looks better and better every new set of pics!! You are doing a bang up job !